Me: Hey. Can I get a small pepperoni pie? Her: (Seeing that I am alone) Oh, you mean personal pizza, right? Me: No, a small pie please. Me: Yeah. I’m gonna order the small pie and eat the whole thing by myself cause I love pizza and the feeling of being full reminds me of when I was a kid and my mother would feed me to assuage nervousness of being out in the real world. What you don’t know, Christina, is that I’m restraining myself to not order the large. Understand that if I was having this thing delivered to my house, it would be a large, and yes- I would pretend that I wasn’t the only one home so the delivery guy thought I wasn’t a slob. I’m digressing. Folks, the point I’m trying to make is, I’m on the inside of this and you must believe me when I tell you removing bread is the act of a desperate man. There’s no joy in the heart of someone who removes bread for two fried chicken cutlets- alas, only plaque. Why KFC would do this- there is only one reason. I know it sounds harsh- and I don’t know why- but I have put a lot of thought into this and it makes the most sense. Putting a gun between two pieces of bread would be a safer sandwich. What ideas did KFC reject? The “Hair Dryer-Deluxe” because it was too difficult to get people to bite into it while standing in a puddle? They want you dead. The Colonel is from the military, right? He must have some education of mass-killings- I know he’s long gone but maybe a distant crazy nephew stumbled on some secret recipe for ethnic cleansing or something- we’re through the looking glass here. If you find yourself ordering this sandwich- or dying to have one- stop- look yourself in the mirror and try and figure out what went wrong. KFC – who by the way is clearly in a struggle for it’s very identity, because didn’t they just try and get you to eat “grilled” chicken pieces recently? KFC is claiming that they are not using bread here because there’s so much chicken, “there’s no room for a bun”. It’s a desperate lie, by some desperate person in marketing. First off- I have seen bread as long as 6 feet- on numerous occasions- it’s called a 6 foot hero- it exists. Bread here is not the problem. 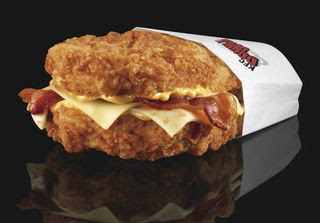 My advice, stay away from this lie of a sandwich until I can figure out why KFC wants to kill you. I saw the commercial today and read about it last week. And I love the people in the commercial are totally fit individuals. It's harsh. Did you have to go and eat it to know it was terrible? With their image on the down, they are desperate to generate money; however, I think the DD alienated them further. Maybe they should share pictures of their chicken farms. I like my chicken, but that is not the right way to raise food.